I love to visit other blogging blogs and read their articles. I enjoy seeing other blogs in my niche, reviewing their designs and reading about the unique perspective and writing style each blogger brings to the table. The knowledge I gain from these visits helps me to better help you build a blog. Here’s the problem though: the blogging advice on the internet is a mixed bag and you really have to be careful. Some of the information is great, some is just frankly terrible. This brings me back to topics that are discussed too much, and which are not. The more popular topics are things like: making money blogging, build a blog, make money fast blogging (which is next to impossible by the way), and other make money online topics. Why? Because they are popular search topics and are often filled with affiliate offers or ads to earn the blogger money. Do these articles serve us the general reader population? Perhaps a little, but in general often not very much. The articles are all the same and on the same boring old content. The content is just re-churned a million different ways, but it all says the same old thing. Boring….yawn, comma inducing. As Google begins to move away from the older search model of back links and keywords, to a new model based on social popularity, authorship and author rank these dime a dozen articles will begin to move down the search results pages. What will begin to rise to the top are articles that provide real value and substance to readers – the really great and popular content will rise to the top. Based on some tracking I’ve been doing and a number of other experts I’ve been interacting with on Google+, we are already seeing this trend. What’s the key strategy to writing this great and popular content? Seriously, if you don’t love the topic and you aren’t passionate it, you’re just wasting your own time and the time of thousands of readers on the internet. Don’t be that guy or gal, there are too many of them as it is. Everyone will know you’re not passionate, everyone will see it, and you’ll just be miserable. Oh sure, you might make money in the short term, but I guarantee you’ll make a whole lot more in the long term doing something that you absolutely love. All of those top ranking re-churned articles I mentioned earlier? They are full of great keywords, but in most cases they are not written by writers passionate about their topic. How can you tell? Easy, just read them. I personally can tell pretty quick whether or not a blogger is passionate about what they’re topic and I’ll bet you can too. I’m not really sure what specific qualities tell me this, I just know I can pick it up, and pretty quickly at that. I’ll bet you can too. Guess what? Google can tell too. With Google Plus, Authorship and Author Rank, they are going to get a whole lot better at it too, mark my words. Is making money from your blog your reason for blogging? Did you start your blog to make money? If so, you started it for exactly the wrong reason. If you blog only to earn money, you will most likely fail. Why? You have to write almost everyday about the topic. If you aren’t passionate about what you are writing on, you will quickly get bored and writing will become a chore. Once that happens, your readers will know and they will leave. You repeat the same stuff over and over. See, if you aren’t passionate, you content won’t be varied. You won’t spend time reading and researching like you should and you won’t explore the outer fringes of your topic where the new and unique content ideas live. Making money blogging is all about converting your readers. Converting means telling them about something and then them buy it. If you aren’t passionate about the topic you’re writing about or the product you’re telling your readers about, they won’t buy it. Why buy something the author isn’t even excited about? That’s why I only promote products I personally use and love. Sure, I could do tons of reviews of various products, but they would be boring and you probably wouldn’t click on them. I’d rather write up a few reviews/recommendations on things I’m excited about and provide value, and have you buy those. One of my favoriate books is called No More Mondays by Dan Miller. The book targets people who dread going to work on Monday because they hate what they do. The book walks you through a plan to help you find what you love to do and how to start doing it. Once you are doing what you love to do, there are no more Mondays. If you haven’t read this book, I’d strongly suggest you pick up a copy. No More Monday’s is an quick and easy read, but it will change the way you see things. Perfect example: Me. When most people have spare time, they read a novel, work on a hobby, watch TV, etc. Me? I like to work on this blog – that includes writing, making design changes, looking at my Google Analytics data, and participating on social media. I would love to do this full-time and hopefully someday I will. I’m passionate about blogging, running websites and writing. I’ve been that way ever since I started my first blog and that blog literally changed by life. As I was surfing and reading some of those “no passion” blogs last night, I got really frustrated. I thought to myself, I know I blog about earning an income blogging, but I really hope my readers know it’s not about money, it’s about doing what you love. I hope they know that doing what you love can lead to money. I hope they know that while I love earning money (who doesn’t? ), what I love more is helping you and interacting with you. I was so passionate about making sure you understood how important this concept of passion was, I immediately started drafting this article. For those of you that that have been blogging for a while, you’ll understand exactly what I mean – Have you ever sat down to write and article and the content flows out of your head so fast you can barely type fast enough to keep up? For me, this was one of those articles. I am so incredibly passionate about making sure you write for your readers and be passionate about your blog topic that I literally couldn’t wait to publish this for you. If you walk away with just one thing from Side Income Blogging, again, walk away with this: Build a blog you’re passionate about or don’t even bother building it. If you are passionate about what you write on, success won’t be something you’ll have to work at it, you won’t dread sitting down to the computer to write “yet another boring article”, you won’t have block off time just to do social media. All of that will just happen and you’ll like it….no, you’ll love it. What topic should I build a blog on? A topic you’re passionate about! Kidding…kidding….I know, sometimes that’s not always easy to figure out. If you’re like me, I’m passionate about a number of things. Fortunately I’ve already written an article that will walk you through a process that will help you come up with a blog you are passionate about and can earn money from. Just read my article: What should I blog about? Being passionate about your blog and your topic will be critical to your success. I beg you to chose a topic you love, chose a topic that you can write on effortlessly and most importantly choose a topic that you would write on even if you didn’t make money. Are you passionate about your blog? Enjoyed the post! I was in a recent conversation about dumping your personal blog for Google+ and my position was “no way, I am passionate about what I blog about!” This really resonated with me, thanks for sharing! Hey Tim, first off, I really enjoy reading your blog – so thanks for writing. I’m glad you enjoyed the post and glad it resonated with you. Hoping it does the same for many others as well. I find that when I am writing, I am always telling a story, and what is the best source of storytelling other than life experiences… in which my passion is living life to the fullest. So, I agree with you 100%, in that you need the passion behind the story, behind the blog, absolutely! Great post! Thank you Ray – My natural style (or voice) is to put a lot of me personally into my articles. I think it really helps people relate, making the article more effective. Honestly, not even sure I could write any other way! Thanks for your comment and compliment. I think that more and more bloggers are starting to blog about everyday life these days. I mean one can just read the news and have plenty to blog about. Although I do agree that the majority of bloggers are out to make a dollar. Hey Larry – I agree and am seeing that trend as well. So many new blogs are targeted at making a quick buck, then quickly die off when the owner’s realize there is no such thing as a quick buck blogging. Sad really. Hi Larry, excellent work! I thoroughly enjoyed reading this post. Very enlightening I must say. I admit that I also do blog hops to review some of the same things you stated at the beginning and from what I’ve seen so far I totally agree that content is a key area to work on. I mean other things are important too. When the focus has shifted more to money making, I believe there is a tendency for a watered down generic content. I am open constructive criticism on my blog. But same time, I am constantly reviewing my own work each day – just because of the passion within me to be different (niche) and better at what I do. 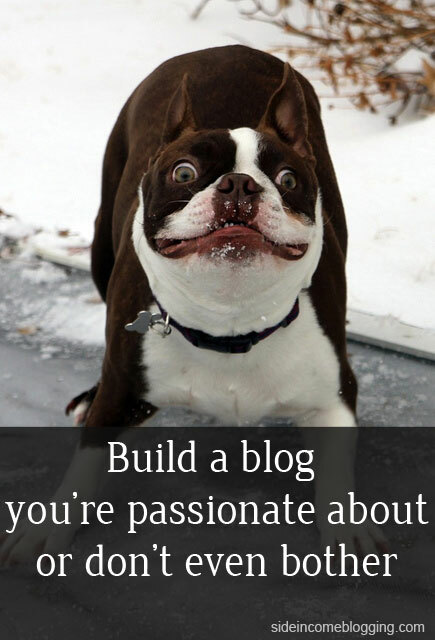 Wow, build a blog you are passionate about. Again great advice! Thank you Yvonne. I’m always trying to find ways to be different and set myself apart. Writing like everyone is easy, but being a unique voice hard and requires a great deal of work. I spend a lot of time thinking about my content and what to write on. Like you, I always try to be better. Thanks for your comment and support, I really appreciate it. I agree with you 100%! I blog about a small niche and from the beginning, my intention has been to share resources and leads to interesting restaurants, people, books and events with like-minded eaters. Making money? I don’t see it yet but while I continue to build my reader base, every week is a new and exciting adventure. Hey Liz, thanks for commenting. Sounds like you’re enjoying the blogging journey, which is great. I personally love it myself. If I’m making money, just icing on the cake, but perfectly happy just writing, talking to people, and watching my blog grow. really nice writeup. In my country I see that most blogs write about tech gadgets or blogging about blogging or money making . thats useless to the user. Thank you, I’ve seen that trend as well. Lots of people picking popular topics, it hopes that they can build a quick site to earn a quick buck. Seldom if ever works out. A success money making blog takes a combination of passion, hardwork, knowledge, skill and time … lots of time.